The Dental Implants which are placed in the patients mouth that include both maxillary & mandible implants are called Maxillo facial dental implants. It is a treatment for missed or fallen out teeth. When the implants are maintained properly, the results and durability of such implants will last for a decade. Regular cleaning and flossing help keep oral hygiene intact and extends the life of implants. 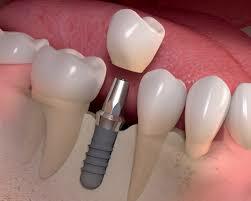 The success rate for the dental implant procedure is high. As the first step, the patients nature of bone healing and other factors are checked by the dentist. The site of tooth extraction is inspected by the surgeon before commencing the procedure. Dental implant procedure generally involves a few steps for administration. A titanium material implant is placed in the jaw bone of the patient so as to avoid the reaction with tissues and natural bones. Once the healing process is over, the patient feels relieved and the crown is placed on the implant. Osseointegration is the major element that decides the success of Maxillofacial Surgery. Dental Implants are used in many types of dental procedures in oral surgery to ensure patients do not lack any tooth in any particular quadrant of their mouth. In accident and trauma treatments, surgeons reduce or add bone tissues and structures in the mouth. This may lead to natural tooth loss during the procedure. Hence, it is important for placement of artificial teeth in the form of dental implants to gift yourself with the perfect, broad smile. The healing process depends on the patients medical history, age, and gender.However, the dental implanting procedure is a boon for people who have lost their natural teeth, which can be easily replaced through such procedures. Dr. Philip Mathew (Oral & Maxillofacial Surgery) heads JP Dentofacial & Implantology in Thrissur, Kerala. We are proud to say that our centre is a renowned place for Dental Implants in Kerala. Missed, broken teeth are replaced with the dental implant technique, in simple terms, teeth fixing.